The all-new Fiat 500X is the latest addition to the FIAT lineup, combining the authentic Italian design and engaging driving dynamics synonymous with the FIAT brand, together with advanced drive systems, unmatched functionality, and a full array of safety, comfort and convenience features. The Fiat 500X offers up to 70 standard and available safety and security features, including Forward Collision Warning-Plus, LaneSense Departure Warning-Plus, Blind-spot Monitoring and Rear Cross Path detection. Electronic stability control (ESC) with Hill-start Assist and electronic roll mitigation is standard on all models, as are seven air bags. The all-new Fiat 500X was designed at Centro Stile in Turin, Italy, where designers leveraged the character and iconic features of the Fiat 500 into a larger and more mature package. On the exterior, design elements like double headlamps, a trapezoidal nose, the signature “whiskers and logo” face and the rounded clamshell hood pay homage to the original Cinquecento. The purposeful and distinct Italian design carries through to the interior with clever storage, body-color instrument panel, a circular cluster display and iconic door handles. The Fiat 500X is available in five trim levels: Pop, Easy, Lounge, and for a more rugged look, Trekking and Trekking Plus. The Trekking and Trekking Plus models feature unique front and rear fascia designs, and satin silver accents for a distinct, adventurous appearance.  Auto: The basic mode calibrated for everyday driving and designed to ensure optimal fuel efficiency, low emissions and driving comfort. This is achieved with a smoother engine calibration, higher servo assistance on steering and a shift point optimized for low carbon dioxide emissions.  Sport: The engine calibration converts for a sportier feel and is tuned for a faster driving response through electronic stability control and steering calibrations. With all-wheel drive, this mode optimizes the transmission for lateral dynamics.  Traction +: A specifically calibrated mode maximizes low-speed traction with low friction and off- road surfaces by providing additional wheel slip through specially tuned chassis controls and a more direct engine response. The instrument cluster features a standard monochrome and available color 3.5-inch thin-film transistor (TFT) cluster display, which allows drivers to customize and monitor information like fuel economy, outside temperature and driving range. At the center, the Fiat 500X is available with the Uconnect 5.0 or 6.5 radio system, providing passengers with information and connectivity options on a 5-inch or 6.5- inch touchscreen. The Fiat 500X interior also provides unmatched utility, featuring a large rear cargo area with a height- adjustable rear cargo floor, second-row 60/40 split seats and fold-forward front passenger seat. Clever storage adds to the functionality of the 500X, including a dual glove box with a locking lower portion, center console storage and a bin at the base of the center stack that allows for storage and connectivity. The all-new 2016 Fiat 500X offers a range of communication, entertainment and navigation features, making a host of features once found only in premium vehicles available in the small crossover segment. The Fiat 500X includes a standard monochrome and available color 3.5-inch thin-film transistor (TFT) cluster display, which allows drivers to customize and monitor information like fuel economy, outside temperature and driving range. Also available is a full array of technologies that provide additional comfort and convenience, including a space-saving electric park brake, cap-less fuel filler door, standard Tire-pressure Monitoring system with tire-specific display, Keyless Enter ‘n Go with valet key, heated front seats and steering wheel, ambient lighting and heated side mirrors with turn signals. The all-new Fiat 500X showcases Uconnect’s award-winning in-vehicle handsfree communication, entertainment and navigation. The Uconnect 5.0 system (standard on Easy and Trekking) features a 5- inch touchscreen with Bluetooth handsfree calling, voice-command control of AM/FM radio and streaming audio, and SiriusXM Radio (including a one-year subscription). Also available is Uconnect Access Via Mobile (with a five-year subscription), which enables drivers to ￼connect and control their personal Pandora, iHeart Radio, Slacker Radio or Aha Radio accounts using ￼the vehicle’s Uconnect system. The Uconnect 6.5 system (standard on Lounge and Trekking Plus, available on Easy and Trekking) includes all of the features on the Uconnect 5.0 system, but adds a 6.5-inch touchscreen, GPS navigation, HD radio, SiriusXM Travel Link (including a five-year subscription) and SiriusXM Traffic (including a five-year subscription). SiriusXM Travel Link can be operated via voice and provides premium data services and information, including weather, fuel prices, sports and movie listings. SiriusXM Traffic works with the vehicle’s navigation system to display traffic speed and flow information, along with accident information to assist drivers in routing around congested areas. Also available is the BeatsAudio premium sound system, which includes a subwoofer and eight speakers for studio-quality sound. Safety is a priority for the FIAT brand, and the multitude of features available in the all-new 2016 Fiat 500X demonstrates that importance. The new small crossover offers up to 70 standard or available safety and security features, including the availability of Forward Collision Warning-Plus and LaneSense Departure Warning-Plus. 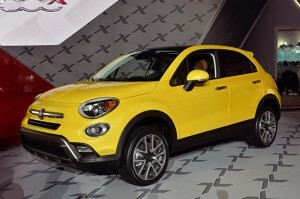 The Fiat 500X is supplemented with both active and passive safety and security features, including Blind-spot Monitoring, Rear Cross Path detection, ParkView rear backup camera with dynamic grid lines, electronic stability control (ESC) with electronic roll mitigation and seven standard air bags. 51. ParkSense rear park assist system: The system utilizes ultrasonic sensors at low speeds in reverse to detect stationary objects.